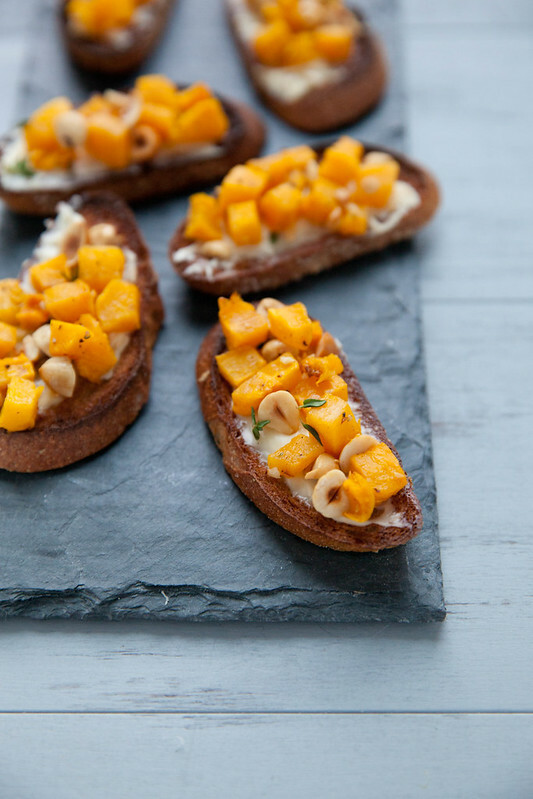 My contribution are these roasted pumpkin hazelnut crostini. 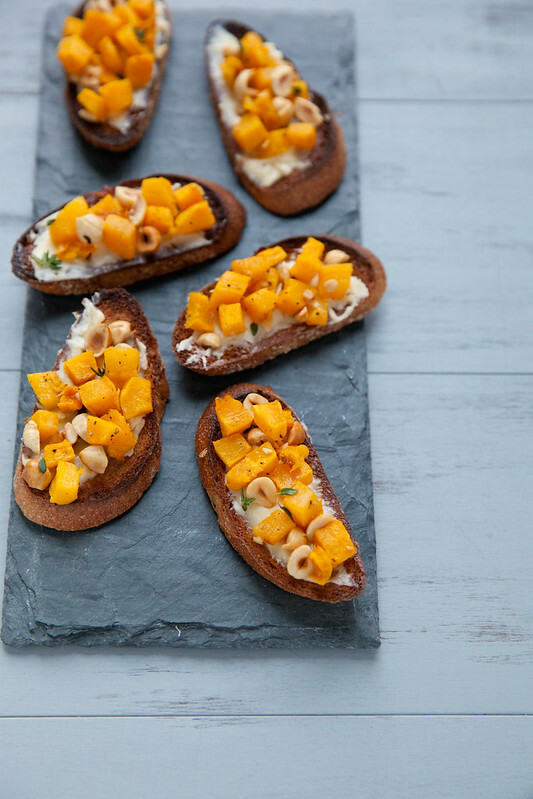 Crostini are one of my favorite appetizer options for any party, so this version with a spread of soft cheese, roasted pumpkin and hazelnuts, and a touch of fresh thyme seemed a perfect fit for a fall-themed shower. This combination worked so incredibly well together and we found them irresistible. The roasted hazelnuts are especially delicious so don’t skimp on them! Andrew was helping me make these and decided to drizzle a tiny bit of honey onto his crostini. That was a lovely addition as well. In fact, we loved them so much that we ended up calling them dinner. After all, the best party foods are those worth ruining dinner for, am I right? Congrats Joanne! Wishing you and The Boy all the best in the future. 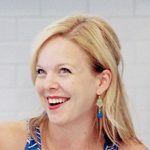 Check out the full list below to see all of the other contributions to Joanne’s shower from so many wonderful bloggers! Preheat the oven to 375˚ F. Line a rimmed baking sheet with foil or a silicone baking mat. Place the hazelnuts on the baking sheet and roast for 10 minutes. Remove from the oven, wrap in a clean kitchen towel and let cool about 5 minutes. (The towel will trap in the steam and loosen the skins of the hazelnuts.) Keeping the towel wrapped around the hazelnuts, rub your hands over the top of the nuts, rolling them around gently. This will remove the majority of the skins. The others should come off easily when rubbed. Coarsely chop the nuts and set aside. Place the pumpkin on the now empty baking sheet. Drizzle lightly with olive oil and season with salt and pepper. Toss gently to combine. Roast until tender, about 15 minutes. Remove from the oven and mix the cubes of pumpkin with the hazelnuts. Heat the broiler to high. Lightly brush the baguette slices with olive oil and place on a baking sheet (no silicone baking mats under the broiler) in a single layer. Toast just a minute or two, until browned and crisp. Remove from the oven. Spread each baguette slice with some of the cheese, top with a spoonful of the pumpkin mixture and sprinkle a few thyme leaves over the top. Serve immediately.